This eighteenth-century French embroidered bed hanging has all the sumptuousness and curves one might expect from a Rococo textile. However, the symmetrical, repeating undulation of the branches is punctuated by specificity and variety discovered through close study and interest in the natural world and expressed through the visual language of luxury. Among the golden perches and colorful blossoms sit birds whose intricate plumage is articulated through delicate handwork based on contemporary ornithological prints. The use of prints as inspiration, as well as the shared complexity of process in print and textile making, results in a design capable of transmitting narratives about cultural values and contemporary interests. In keeping with the luxurious aesthetic of many Rococo interiors, this bed hanging of heavy white silk is a wealth of metallic effect and texture. It is embroidered with gold thread, gold foil strips, and colored silks, which give the feathers of the birds a silky sheen and the flora a light-catching sparkle. The majority of the flowers and branches, which make up the bulk of the pattern, are symmetrical, while the birds are vertically offset and dispersed within the pattern. 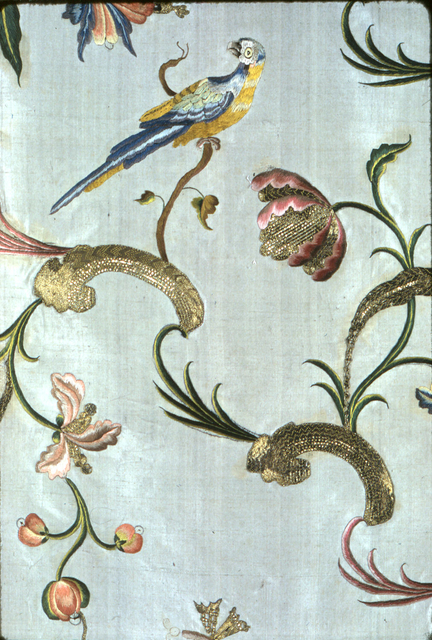 Adding to the delight and interest of the piece, in each panel there are eleven birds on display, all of which are unique [Fig. 1]. Additionally, this hanging is one of two in the Cooper Hewitt collection, that are part of a larger set. The Metropolitan Museum of Art and Colonial Williamsburg have hangings from the same set and donor, and there are instances of other textiles that appear to be based on the same print source. However, the same hand did not embroider these, as they appear to be finer, more detailed, and include additional themes. The naturalistic, varied appearance of the birds was not simply imagined by those doing the embroidery, but rather their design appears to be taken from a set of ornithological prints by Xaviero Manetti (1723-1784) commissioned by a man who had an aviary. The prints were completed over the course of many years in Florence, and were produced in multiple folios. The resulting publication, Ornithologia methodice, is composed of 600 fine plates and, like textiles it inspired, is incredibly labor intensive, luxurious, and coveted by collectors. 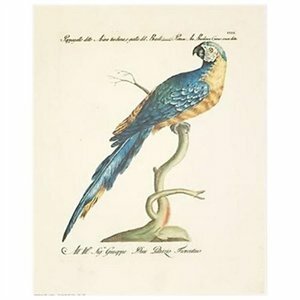 It is “…perhaps one of the finest bird books issued to date, and one of the most sumptuous publications of the Italian eighteenth century…[h]is plates are larger and better engraved and more splendidly coloured…[t]he birds are no longer perched on sham branches. There is an endeavor to show them in their natural surroundings…” (Sitwell, et al., p. 10 & 92). It has also been suggested that Manetti’s aim was to personify the birds, giving them “the habits and mannerism of contemporary Italian society” (Peter, p. 70). Whether Manetti was creating a narrative and engaging in social commentary, or trying to explicate the wonders of the natural world, the richness displayed in his folio of prints tell us about the values of 18th century culture. The formal similarities between a detail of the embroidery in the Cooper-Hewitt Collection [Fig. 2] and a print attributed to Manetti [Fig. 3] illustrate how the richness and personality of Manetti’s print folio was parlayed into the Rococo textile designs. The set of bed hangings, the publication that inspired them, as well as a fascination with the natural world are indicators of wealth and conspicuous consumption, which are arguably synonymous with the Rococo aesthetic. These textiles, like the prints, were in their making quite the undertaking, and the result is two incredibly artful objects that indicate luxury and exotic exploration, hallmarks of Rococo. Bed hanging, 18th century. Silk embroidered with silk satin stitch and couched metallic threads. Gift of Anonymous Donor. 1952-166-46-a.